‘Allo, friends! I’ve just realized that I never got to sharing the lovely trip abroad that Mumbles and I took earlier this year. So, in the spirit of back to school and getting back in the routine of blogging, I thought I’d do the ol’ “What I did on my summer vacation” bit. It’ll be a lot easier in English than having to do it in Spanish, as I recall. Although, BFOTB can attest that a time or two after a few too many sangrias (or in desperate transportation emergency situations), I have been known to spout out near-perfect Spanish almost in a Will-Ferrell-esque Old School moment (feeling like you’ve blacked out after giving very impressive remarks). I should start by saying that I’m not quite sure I’m sane because I did leave dear Mumbles in Amsterdam for few extra days of gallivanting and boy-like shenanigans with fraternity brothers following our week and a half long trip. (!) I dare say as he kissed me goodbye at the airport that I was praying he’d make it home in one piece and without any embarrassing face tattoos! We had such an extraordinary trip and I reveled in spending such quality time alone with him exploring and discovering new cities, cultures and cuisine. After a long flight from LA to New Jersey and an even longer flight from the US to Germany, we arrived in Stuttgart having missed our connection into Dusseldorf, just an hour plane ride away. Blast! The next flight they could get us on was that evening so we happily decided to spend the day exploring Stuttgart. Plus, it’s fun to say. Schtoot gahrt. See? Fun. As luck would have it, Stuttgart happens to be home to the Mercedes Benz Museum…so you can guess where we spent our afternoon. It was really a beautiful museum, very modern and interesting. I had no idea Mercedes Benz has such a storied history. 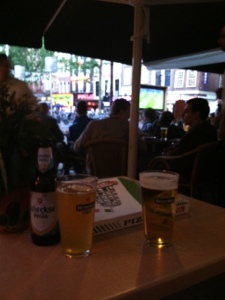 getting caught up in the crowds and cheers of european soccer. Once in Dusseldorf (also a fun one to say), we walked most of the city on foot while it rained on and off. And, trust me, I’m not usually fond of rain (curly hair and all) but this definitely was the more picturesque movie-quality rain where you hop underneath a storefront canopy after getting poured on, shake out a bit, giggle together, kiss, hold your jacket above your head, and run back out to face the day together. At least, that’s how I’ve romanticized it in my head now that it’s months later and I’m warm and dry as I type. We found two microbreweries to try the Altbier, a traditional beer made in Dusseldorf. The promenade between the Rhein and Altstadt is apparently known as Europe’s longest bar, as cafes and bars line the whole way, very similar to those of Barcelona, except much less club-like. W were fortunate to happen upon a restaurant bar one evening that was not too busy so we could stay in to watch the Spain v. Portugal soccer game during Euro Cup… it was a very boring match up until the shoot outs but still so fun to be in such lively company while watching. 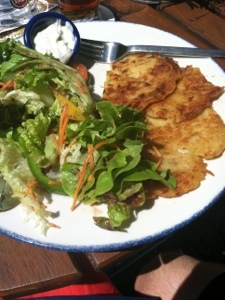 potato pancakes just like my Papa makes! One afternoon while exploring the city by bus we got off in the Alstadt for lunch where we had ventured around on foot the day before. We couldn’t read the menu at the cafe but when we saw the woman next to us receive a plate of what looked like my Papa’s (grandfather) delicious potato pancakes we knew exactly what to order! They were superb! We ate outdoors and hopped back on the bus with a refreshing homemade sparkling lemonade with ginger and basil – my new favorite! Across the Rhein they were setting up for what looked to be a very large festival in the coming weeks – all I could think was how unfortunate that we wouldn’t be there to enjoy it. Funny how timing can seem so off and then surprise you in the most delightful ways. Our last night in Dusseldorf we watched the Germany v. Italy game at a microbrewery in the Altstadt. It was the oldest brewery in town called Zum Schnissel – we really enjoyed the beer here in Dusseldorf! Plus, I can’t tell you how spectacular it is to be in a country that idolizes a sport while their team is playing. I also can’t describe in perfect words the sadness and heartfelt disappointment these dedicated citizens feel when their beloved team loses. It’s truly an aching sadness to see — painted faces being wiped clean, a wave of depression that comes over a crowd, beers left unattended on tables instead of raised high in cheers amidst the crowd. Still, what an exhiliarating evening! We did see some spiriting Italians closing down some streets with impromptu celebrations, flags waiving, releving in the safety in numbers game. Unfortunately, we forgot to buy a Christmas ornament for our tree while in Dusseldorf. That’s our tradition everywhere we go so that come Christmastime, our tree is lit up with the memories of the places and important events in our lives. So that was a bummer. I mentioned that we found a small place to watch the Spain v. Portugal game one night and it was there that we asked our waitress if she could recommend any towns we should stop in on our way to Amsterdam and she said “Ah, Venlo.” She didn’t seem to think about it too hard so we asked why she’d recommend it and all she could really say was that there was nature there and she thought we’d like it. Good enough for us! We found an awesome hotel and booked a nice suite without much clue of what else to do but noticed in the online hotel reviews that most people staying there mentioned “Floriade.” After a bit of research we discoverd the Floriade is a huge horticultural expo held every 10 years and it just so happened to be in Venlo this year. Going on now. What luck! We bought two day tickets and spent the last two days covering an enormous theme park-like area with five different worlds to discover. If you get a chance, look it up – Floriade 2012. And, heck, if you can fit in a trip to the Netherlands in the next few weeks, you have until October 7 to see it in person. I’ve never seen or heard of anything like it. 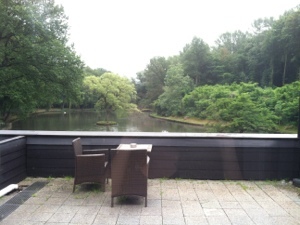 our terrace overlooking the resort’s lake in Venlo. Also, our hotel was amazing. Tucked into a wooded area, it was more like a resort with a gourmet restaurant (best dinner ever!) and our suite had a huge outdoor balcony terrace overlooking a little lake. Gorgeous! The name of our hotel was Bilderberg Hotel De Bovenste Molen in Venlo if you want to Google it. Just lovely. The town was really cute too but I have to wonder what will happen to the area once Floriade is over and they break down the exhibits and structures. I imagine it will be a lot like the Olympic cities after the games. Still, I’d love to go back someday – it was absolutely a perfect getaway. 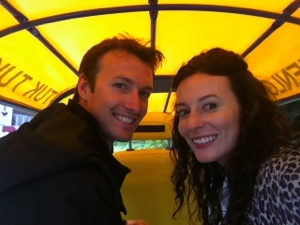 Riding in the open-air tuk tuk (like a bike/cart/ATV) from our resort in Venlo to the Floriade. 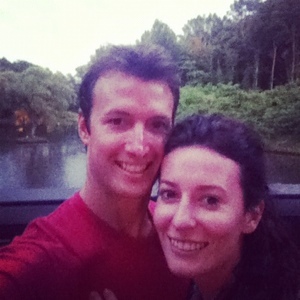 our happy “we just had the best meal ever!” faces enjoying dessert on the terrace one evening. those Heineken folks are clever! 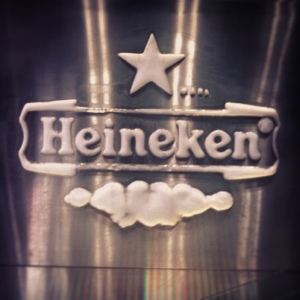 This logo sign is made out of ice! Fancy! While in Amsterdam, we did the Heineken Tour, did some thrift store shopping (which I love anyway but seems so much more chic in another country) at a really interesting place called Out of the Closet. They have locations in the states – in fact I think the only one abroad is in Amsterdam; the stores benefit the AIDS Healthcare Foundation while also providing HIV testing and some pharmacy services. Everyone there was very friendly and welcoming, even the guys in drag. It was fun. Our hotel was right across from the Stopera, city hall and the opera house. 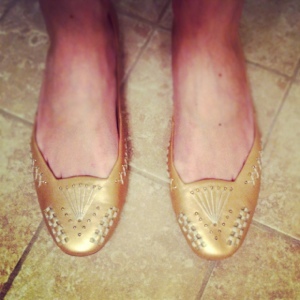 my new thrifted flats. i adore them! 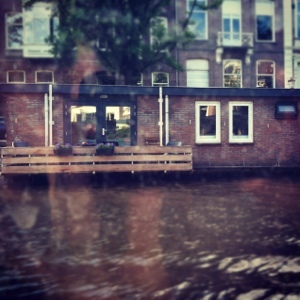 a chic houseboat in one of the channels in Amsterdam. At least I thought they were chic until I found out that most of them aren’t connected to sewers…eww. All in all, we couldn’t have asked for a better vacation. We hadn’t been back to Europe since right after we were engaged in 2009 and we do so love to travel so I definitely hope we can make a habit of it. Barcelona is still my favorite city, probably so because BFoTB and I spent a summer studying abroad there. I’d like to go back and also visit Greece. I’m not quite sure where else. Any suggestions? Collecting Christmas ornaments during our travels is my favorite tradition that we started. Do you collect anything when you travel? 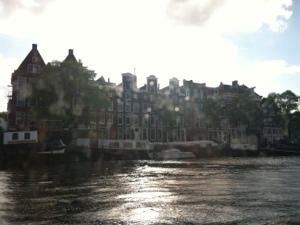 I will say, Amsterdam is a majestic city. The architecture and practically everyone has a view of the water! 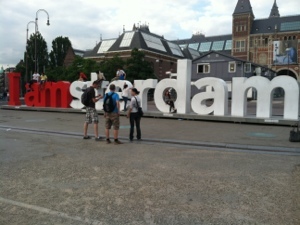 i couldn’t bring myself to take a photo in front of the sign, but seriously, what a brilliant tourism marketing tactic. can you even imagine how many people have shared this photo? Need something sweet in your inbox?